Premium TOP-Line Tips are manufactured in Germany by AHN Biotechnology as a very high quality product meeting the most stringent manufacturing standards for the most discriminating users and at affordable prices. AHN tips have thin walls and a thin surface area at the tip to greatly minimize the possibility of the tip retaining sample droplets. In addition the thin surface area reduces the touch-off angle between the outer tip wall and the receiving sample tube. This reduced touch-off angle virtually eliminates the potential of capillary retention between the tip orifice and tube wall. Tips and other plastic products from AHN Biotechnology are injection molded from autoclavable, non-wettable, premium grade, virgin, low adhesion polypropylene on state of the art equipment in accordance with ISO 9001 and DIN standards.. The use of lubricants that may be harmful to samples is eliminated from the manufacturing process. All dyes used to color the range of AHN products are guaranteed to be completely metal free, eliminating any risk of sample contamination by trace elements. Each of the AHN tips is molded to give a flash-free and uniform delivery orifice for consistent accuracy and reproducible sample delivery. Accuracy and precision are improved due to complete sample dispensing and are the guarantee for GLP conformity in all laboratories. 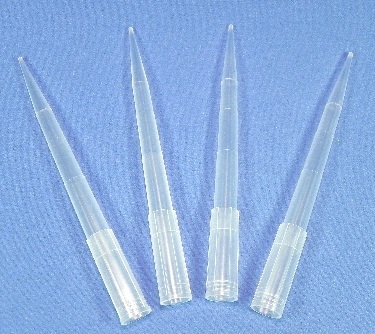 AHN TOP-Line tips with volume range 1 - 200 µL are graduated at 10, 50 and 100 µL AHN TOP-Line Long tips with volume range 100 - 1000 µL are graduated at 100, 250 and 500 µL. AHN tips are fully autoclavable (121°C, 0,1 Mpa, 20 minutes). Free of human DNA, certified free of DNase, RNase, Pyrogen and PCR inhibitors. Use racked, sterile tips for your PCR work. Available in bags or racks, sterile or non-sterile, and in volume case lots as well. 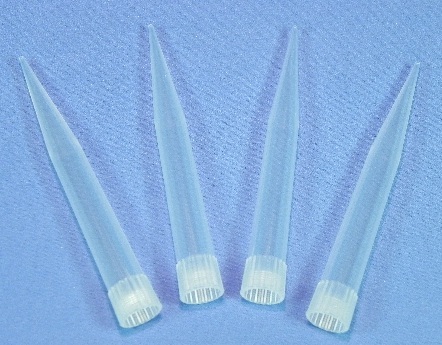 Long tips with volume range 100 - 1000 µL are graduated at 100, 250 and 500 µL. Rose offers the entire range of premium tips manufactured in Germany by AHN Biotechnology, as well as outstanding tips from Swiss manufacturer Socorex and Rose Scientific’s own Rose Brand. Attractive VP (Volume Pricing) is available for case lots or for long term supply contracts for any of the tips available from Rose Scientific. Call or ask about Volume Pricing.